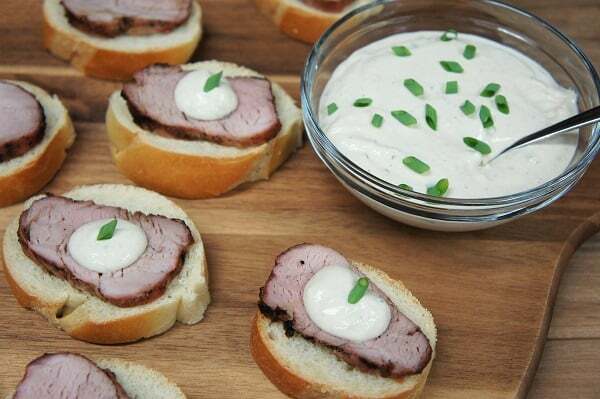 These pork tenderloin tidbits with a creamy horseradish sauce are a lovely appetizer to serve at your next cocktail or holiday party. 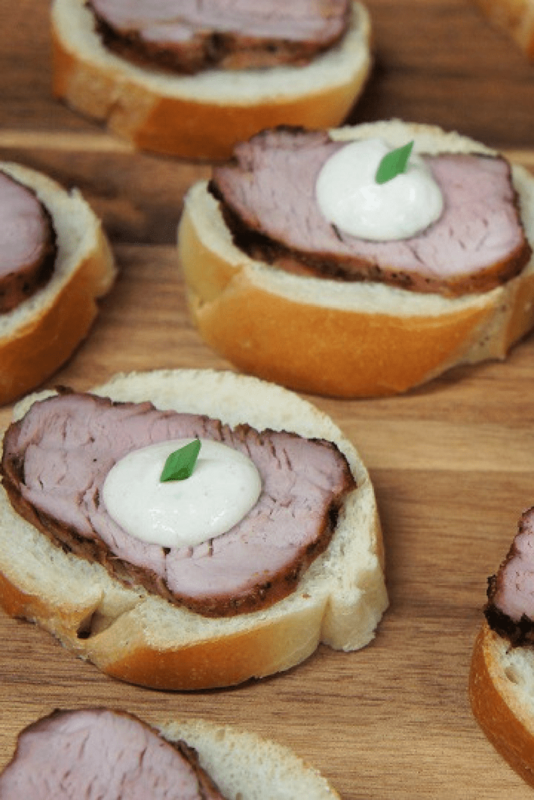 Tender pork is thinly sliced and served on a lightly toasted French bread round, then topped with a homemade Creamy Horseradish Sauce. 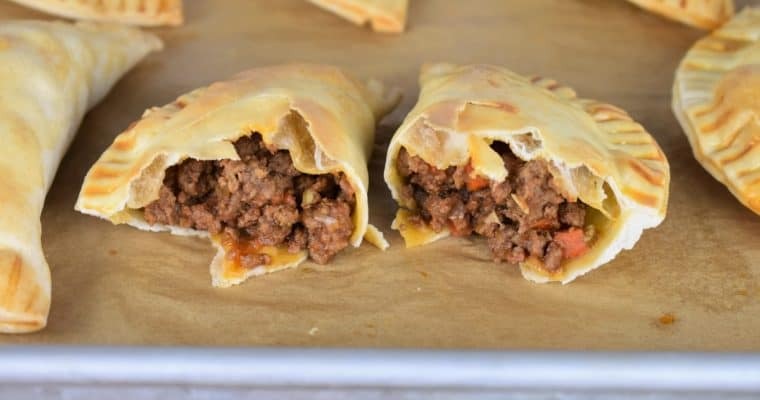 The tenderloin tidbits are really easy to make and absolutely delicious, making them a special addition to your appetizer table. Enjoy! For this recipe the pork tenderloin can be pan fried and finished in the oven, or grilled over moderate heat for 20 minutes or so. Either way, it turns out delicious! In a small bowl combine the salt, garlic powder, onion powder, coriander and black pepper. Sprinkle the pork tenderloin with the prepared seasoning mix on all sides. Set aside. Heat the canola oil in a large skillet over medium-high heat. When the oil is hot, but not smoking, add the pork tenderloin. Sear the pork on one side for approximately 1-2 minutes. Turn the pork tenderloin over and sear another 1-2 minutes. 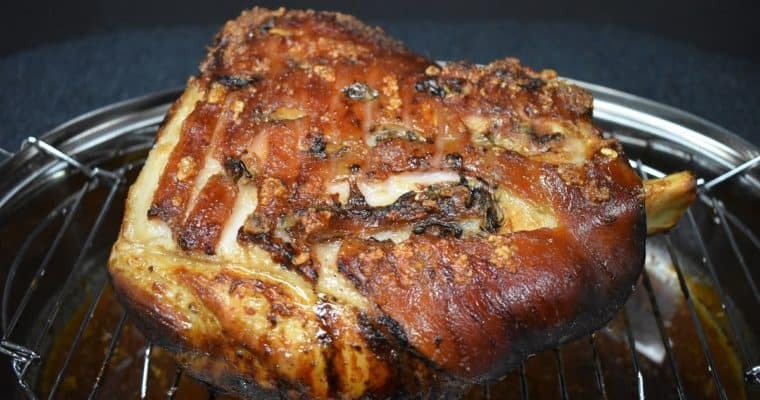 Remove the pork from the skillet and place on a baking pan. Place the pan in the pre-heated oven and cook approximately 15-25 minutes until the desired doneness is reached. Ensure that the internal temperature reaches at least 145°F at its thickest part. The meat will release from the pan when a nice crust has formed. Gently try to lift the pork on one end, if it does not release, don’t force it Once it is ready it will release and you will be able to turn it easily. At 145°F the pork will be quite pink in the middle. I like to take the pork to 150-160°F, but it’s a matter of preference. To avoid overcooking the pork tenderloin (which would be a shame) check the temperature after the first 15 minutes of cooking. Also, keep in mind that the temperature of the pork will rise a few degrees as it rests. Remove the pork tenderloin from the oven and allow it to rest for at least 10 minutes before slicing. Season the pork tenderloin with the seasoning mix as described above. Cook the pork tenderloin on a pre-heated grill over moderate heat for approximately 15-20 minutes or until the desired doneness is reached. Ensure that the internal temperature is at least 145°F at its thickest piece. While the pork tenderloin rests, slice the baguette into thin rounds and place them on a large baking sheet. Bake at 350°F for a few minutes until the bread is warm and slightly toasted. In a medium bowl combine the sour cream, prepared horseradish, Dijon mustard, green onions, salt and pepper. Stir vigorously with a fork to combine well. Refrigerate until ready to use. Thinly slice the tenderloin and place one slice of pork on each piece of bread. Serve with the Creamy Horseradish Sauce.